MORE ITEMS FOR THOSE KIDDOS!! This long waited movie is available on Digital HD November 24, 2015, and on Blu-ray™ Combo Pack, DVD and On Demand on December 8th, 2015 from Universal Pictures Home Entertainment. I can bet if you have a little one like I do, they've found an obsession with these adorable yellow creatures. Start by scooping up the MINIONS DVD for the perfect stocking stuffer! The synopsis says, "Evolving from single-celled yellow organisms at the dawn of time, Minions live to serve, but find themselves working for a continual series of unsuccessful masters, from T. Rex to Napoleon. Without a master to grovel for, the Minions fall into a deep depression. But one minion, Kevin, has a plan; accompanied by his pals Stuart and Bob, Kevin sets forth to find a new evil boss for his brethren to follow. Their search leads them to Scarlet Overkill, the world's first-ever super-villainess." Around the world of the Minions with an interactive map filled with games, trivia, featurettes, storyboards, and more all themed to movie locations. 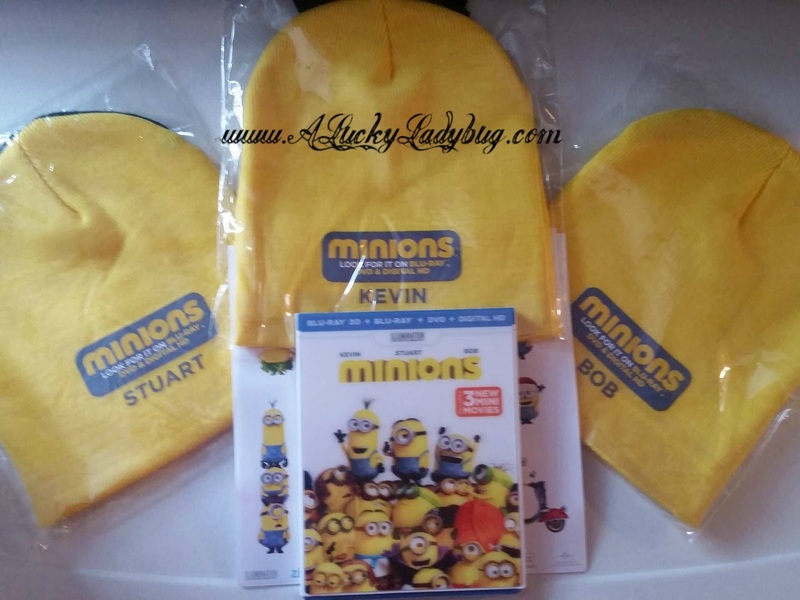 Scoop up some adorable gear for your little one's like these Minions beanie hats and more. Any fan of the little yellow guys will love sporting around their own Minions hat in the coming cold weather season. Plus find toys, stickers, and more in support of this popular release for the Christmas season! 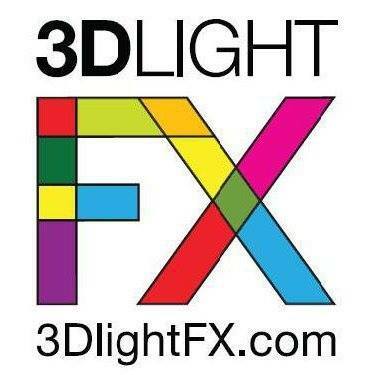 Being that I started with 3D Light FX when they were just getting started themselves, I hold beyond a special place for them. 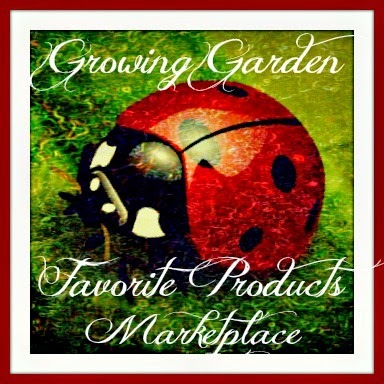 My first review was the Soccer Ball Light which was their only light three years ago! 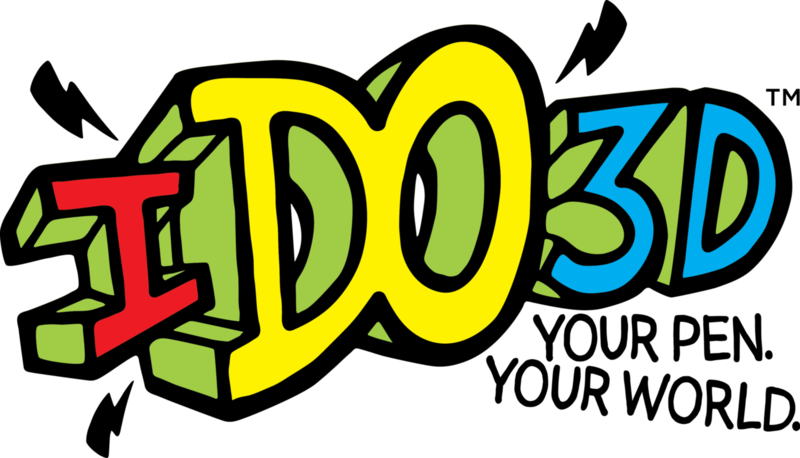 Since then the brand has grown immensely now providing popular brand name lights such as Hasbro, Nickelodeon, Disney, Marvel, and now Warner Bros. and Universal! These are a very different alternative night light for children and teens. The unique feature in all these lights is that they appear to have come through the wall. This light comes with an easy to apply wall sticker that makes the wall appear as if it is cracked and the ball, mask, fist, and now new Minions Minis can be stuck in the wall. This is are a very cute gift idea and alternative to your traditional plug night lights or room decorations. 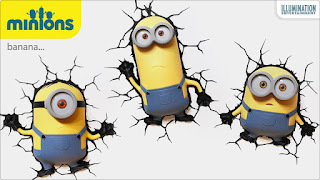 Your little one's will love seeing their favorite Minions characters "coming through" their walls and you can be happy with the reasonable pricing. I feel fairly confident in saying that most any little boy (and little girls of course) growing up in this decade are into LEGO's of some form. 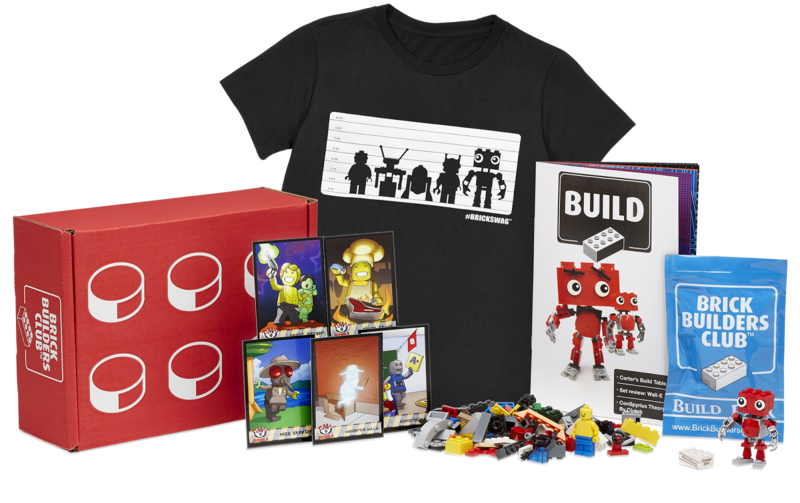 Between the LEGO movie and all the amazing creations you can make, they have become a big trend for kids. It's extremely educational, building skills without even being aware of it. Though the problem with LEGO's (for parents more specifically) is the insane costs involved in acquiring these and all the LEGO swag for your children. 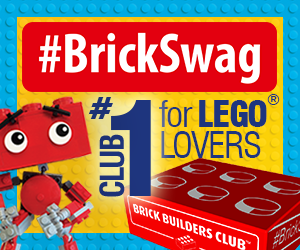 Like a lot of monthly subscriptions, BrickSwag is a Monthly LEGO Box which sends you a variety of LEGO themed items to keep each month! To be honest you pay an arm and a leg for even the smaller sets of LEGO's as well as for something as simple as a T-shirt. I think this is absolutely a great gift idea with everything that comes in the box. 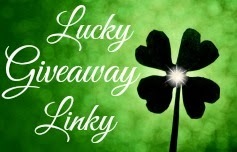 If you order more months, you get a better deal too! Does your little one love the outdoors? What about a passion for arts and crafts? I've finally found a brand which provides a unique and quality combination of both. 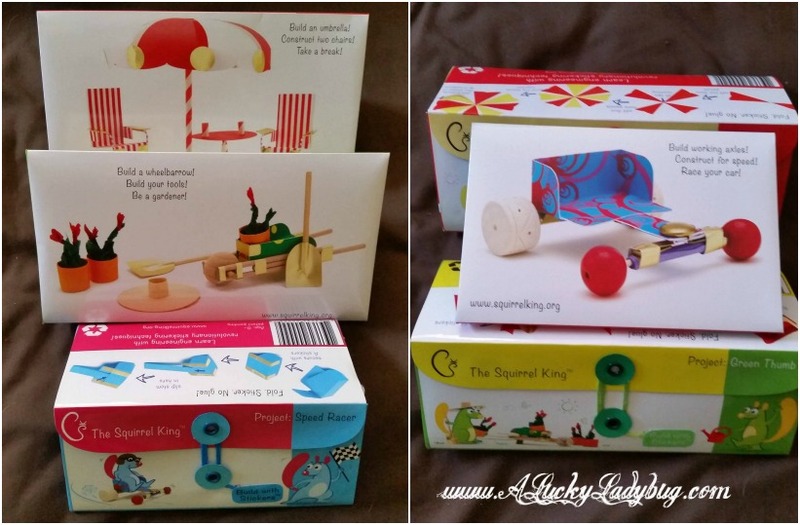 Designed for ages 8 and up, Squirrel King kits are "Build with Stickers" kits. There is no use of glue just smiles and some critical thinking! 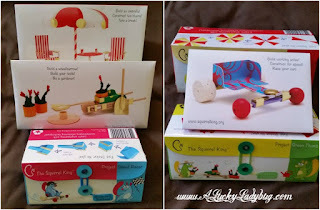 Each colorful kit includes novel sticker-ing techniques and all the materials for children to build, create and explore, making awesome toys at the same time as learning. "STEM (science, technology, education and math) principles are explored in an age-appropriate manner." "The new Build with Stickers Kits are available on the Squirrel King Craft website and at select retail stores, priced from $5.99 to $7.99. The original Squirrel King Craft kit is also available on the website and in over 200 stores across the country, and in a range of choices for $9.99 to $69.99." What kiddo doesn't love a good battle?! 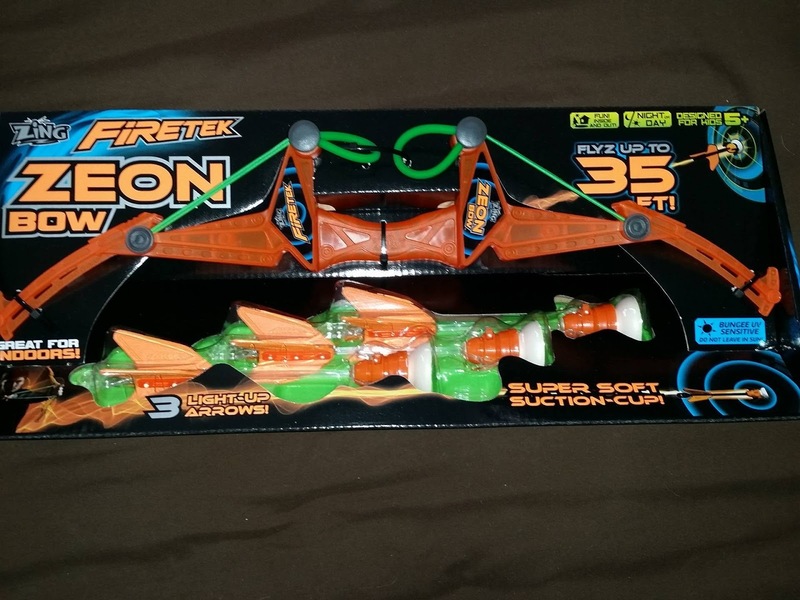 The new FireTek Zeon Bow is a fast loading, light up toy bow. The arrows have fast load loops which make it easy for little hands to load and shoot. Flip a switch to turn on the glowing lights for night play. With arrows that can fly up to 35 feet high, kids can light up your yard with their mad skills. Don't worry, the arrows have a foam suction cup tip so no one will get hurt and no damage caused to your home if they decide to practice indoors. While I recommend teaching kids to shoot from a distance and not at anyone's face, they should be just fine battling it out with their siblings or friends. Now having my own boys I understand something I never did before. Boys are a whole different level of craziness and energy!! Its just a natural thing for boys to competitive and aggressive at times. These are a blast and boy did the boys absolutely love them. So much in fact they wouldn't stop bugging me every day to bring them out. Every child loves to color at one point and time in their life! As a parent, encouraging this type of creativity helps build so many skills for our little ones! It's also a great way for them to express themselves and their individuality. What if you could take their coloring and art to a whole new level?! "Redwood Venture’s IDO3D Art Studio sets use technology to bring amazing artwork to life!" The unique drawing pens use a 3D printing ink (just like the grown up 3D printing technology). The liquid is transformed into a solid in seconds so children can create designs that come to life. Mix colors, create layers, build up or outwards, and just be creative and have fun! 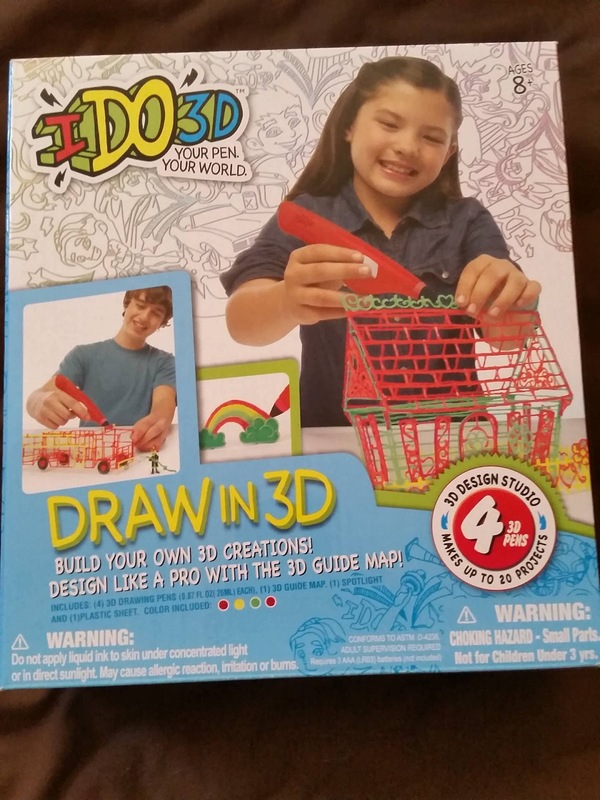 The kit comes with a 3D guidebook, you can download designs online, OR your child can wing it on their own! 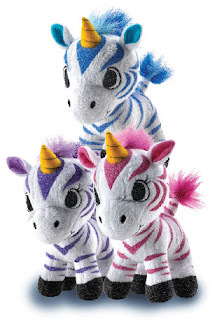 Zoonicorns are a combination between a zebra and unicorn which "visit the dreams of young zoo animals to help them through life lessons." 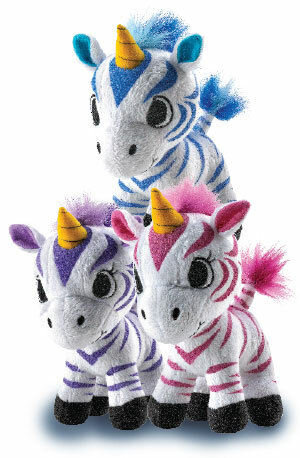 Each Zoonicorn has it's own unique personality and special characteristic. Valeo is the brave leader of the Zoonicorns. Promithea "Promise" is shy and great at keeping secrets. Aliel is full of energy and loves to play with every animal at the zoo. Ene is the mischievous zoonicorn who loves to nap whenever he gets the chance. 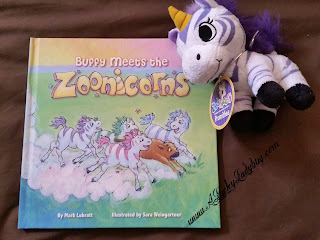 There are adorable books to go along with your Zoonicorn buddies which explains even more about each of them and all they do to help their friends at the zoo. "Each book includes a life lesson for positive reinforcement." Known for versatile, long-lasting and on-trend cosmetic bags, LONDON SOHO NEW YORK® blends this classic fairy tale and functional design in this latest collection to keep you styled like an elegant princess. Available exclusively at Walgreens, you can find products like train cases, weekenders, organizers, wristlets, round top purse kit, clutch sets, and more. Whether you are a Disney fan or your little one is, you are going to be thrilled with the quality of these awesome accessories. Quality made and fun for all ages, these help you sport your favorite princess or villain! 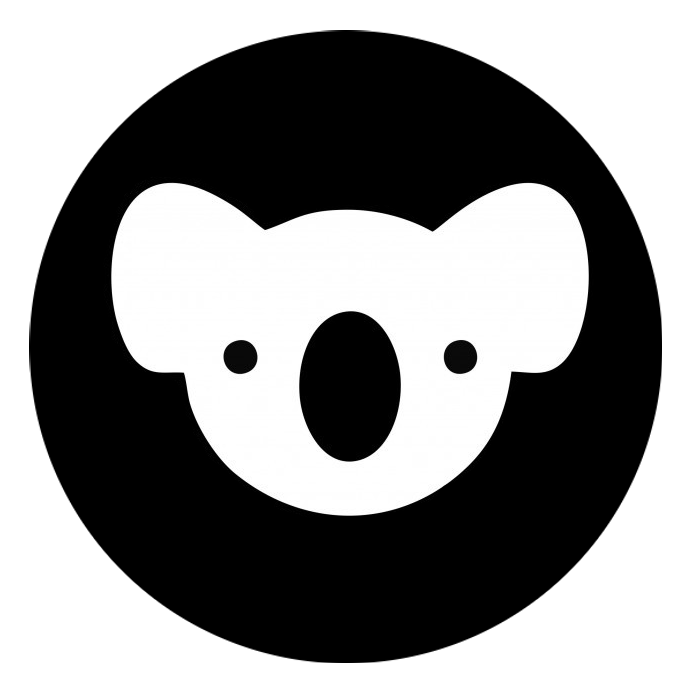 With a gadget like KoalaSafe keeping track of your children becomes much easier. 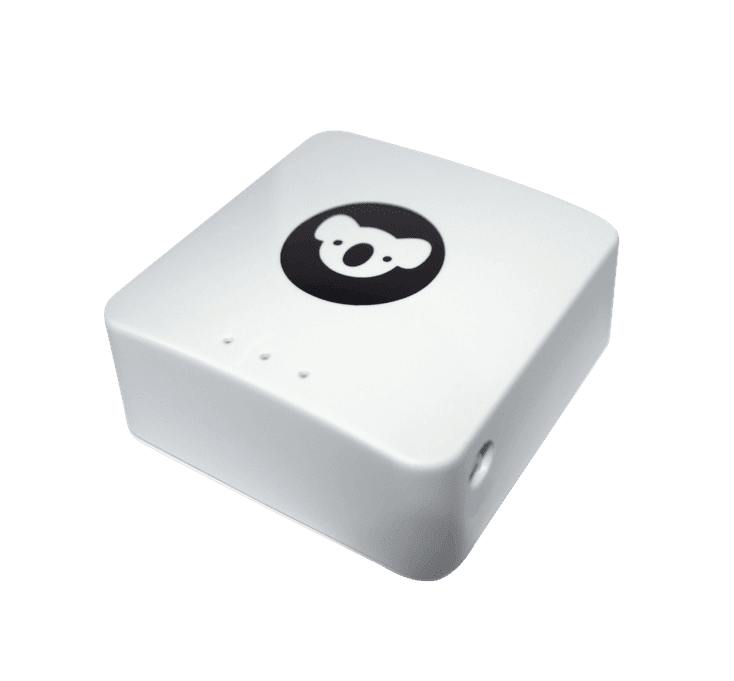 "With a single KoalaSafe box, parents can protect and manage all their children's devices from a mobile device interface." KoalaSafe is an easy to set up device for the whole family. You can monitor AND limit screen time on each device your children use. You can also block specific pages so they no longer have access to them without your permission. The best part is once it is set, there is no more arguing with the kids to get off their phones and tablets. Bedtimes become easier (or at least in my house). 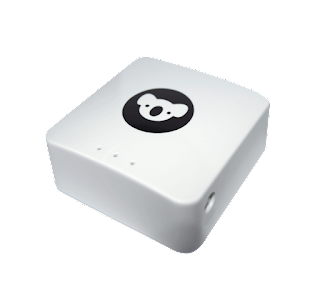 Using an existing router, each device can be connect and becomes part of their own new smart wireless network. Best part is you can even get parental insights on the types of online activities your children are playing with and watching. 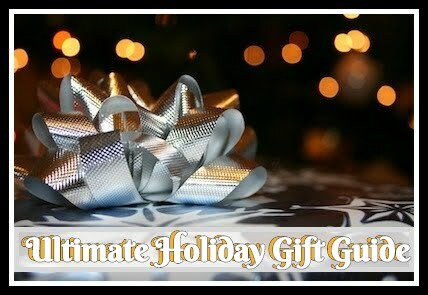 This makes for a great gift this holiday season!